Blissfully Better are made in small batches with the best tasting products and higher quality organic ingredients available. Blissfully Better confections feature high nutrient and low glycemic ingredients that is chock full of flavor. Made with coconut flour blossom nectar that makes him pure and simple go glycemic alternative to other available sweeteners, it slowly releases energy, high nutrients, and 16 amino acids. 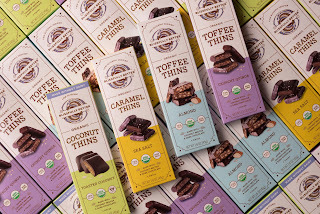 A brand-new flavor has come out just in time for Valentine’s Day and it is Toasted Coconut Thins are handcrafted in copper kettles that are dairy-free and filled with delicious chewy coconut that is sweetened with only organic, low glycemic sugar nectar and 72% dark chocolate cacao and they are also vegan. My Opinion: Each bar comes with four pieces and I really enjoyed the flavor of the toasted coconut and how you notice the word overpowering which sugar sweetness that some candies can have but just the right amount. I like that you can eat two pieces and is only 90 cal and low in fat so this is perfect if you are trying to watch your weight and sugar intake.